Is there anything more comforting in the fall and winter than homemade chicken soup? Perfect for fighting the cold weather and the flu. Simmer chicken and water for about 45 minutes until chicken on the bone is soft and the water is fragrant. Meanwhile, in another large pot, combine olive oil, onions, carrots and celery and stir over low heat for about 5 minutes until vegetables begin to slightly soften. Add the chicken gel bouillon directly to the veggies. Stir and allow to continue to cook until soft. Carefully remove chicken to a large plate or cutting board. Place a strainer over the veggie pot and carefully pour the hot chicken water into the veggie mixture. (If needed, place the veggies and chicken water back into the large pot so that you have enough room). 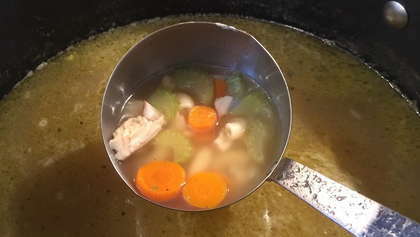 Simmer the soup on low and add 10-12 chicken bouillon cubes testing for flavor as you go. Using your hands, carefully pick all chicken meat from the breast and bones tearing into small pieces. It's important to use your hands to feel for chicken bones. Do not allow chicken bones into the soup as this can be a choking hazard. Place chicken pieces into soup and stir. Bring soup to a light boil and add 1 1/2 cups of dry macaroni noodles. Stir occasionally and allow noodles to cook, about 8 minutes. If needed, add organic chicken broth a bit at a time to the pot to keep the soup at a consistency you like.